What Makes A Top Performing Tweet? 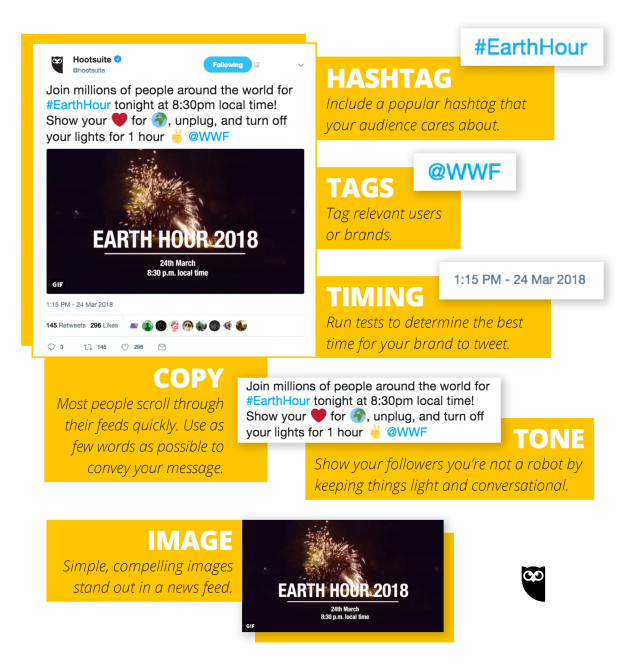 We love this post from Hootsuite which outlines the importance of compelling content and visuals, along with an analysis from a top performing tweet in 2018. Creating the perfect post takes structure, thought, creativity and industry knowledge – when all aspects come together in a positive action, you will have yourself a top performing tweet. How do you structure a tweet? Timing is crucial to getting your ideal audience to see your tweet. Understanding your audience and knowing their patterns will help when choosing a time to post. Try testing out different times in a day / in a week to see which tweets gain the best attraction and engagement. From this you’ll be able to gauge when it a good time to post. In Hootsuite’s case, after testing, they found that afternoons at 1:15pm on a Saturday was a good time for their audience. Having the right image within your tweet will increase engagement. An image can say a million words so they can also be used to add context and information to your posts. An image will make your post stand out too as visuals are eye catching and users will relate to them. Simple images are fine – you don’t have to be a graphic designer to create the perfect image! If you’re posting about an event or something that is relevant to another party, then use tags to make them part of your tweet. If a business or person likes your post, they often will either retweet or @mention in return which will provide more chance of your post being seen. Be selective in who you tag though and ensure that they’re relevant to what you’re posting about. Would your audience understand the association? Get to the point in simple words only! Twitter is extremely fast paced and users scroll through their feeds very quickly. If you want your tweet to be noticed, you need to make sure that your message is clear and precise. Just because you have 280 characters, doesn’t mean you need to use them. Hootsuite tests prove that short tweets are better performing for click-through rates and shares. The way you speak in a tweet should be the same manner in which you would speak to someone over the phone or in person. Therefore, put a human voice behind your tweet and don’t let your messages sound robotic. Light conversational tones are good and allow followers to hear your voice and interact with you at their level in a way that’s comfortable to them. Using hashtags is a great way for your posts to become searchable and more discoverable. They allow your content to show up in more searches which in turn makes it easier for people to find you and potential clients to discover your brand. The key to connecting with people that share your values and are looking for content relating to those values is posting tweets that are relevant and resonate with these users. You can search for relevant hashtags that your audience is already following and use these to strengthen your message. At the end of the day, creating a top performing tweet comes down to understanding what your audience is looking for and getting to know them. This will enable you to create posts that they can relate to by providing value along with simplicity and visual eye-catching material. Looking to get the attention of your ideal audience? We can help! Feel free to get in touch to find out more.